If you are an old reader of this blog, then you are probably aware that I pretty much swear by TuneUp Utilities. Unlike most of the other system utilities, TuneUp mostly delivers on its promises and has saved my back on more than one occasion in the past. Revamped Interface: Once again, TuneUp Utilities has re-skinned itself. The new interface is a mash up of the old interface and the interface introduced in TuneUp Utilities 2010. Tabs are back. However, the overall look and feel resembles the 2010 edition. I praised the previous edition for getting rid of tabs, as it facilitated one-click access to pretty much all the TuneUp tools. However, it also made the interface appear more daunting to new users. With the new interface, it’s often easier to find exactly what you were looking for, but it might require a few additional clicks. TuneUp 2011 also features a new Tuning Status indicator that gives you a quick overview of the optimisations that have been performed, and the amount of optimisation that is still possible. Program Deactivator: This is quite possibly the biggest improvement introduced in TuneUp Utilities 2011. One of the biggest causes of system slowdown is installed applications. They often add new startup entries, background processes and services that consume resources even when not required. TuneUp Utilities always allowed you to remove unnecessary applications from system startup. With Program Deactivator they are taking this concept a step further. When a program is disabled (deactivated), the services that it continuously runs in the background are turned off. However, if you ever need to use this program, TuneUp Programs-on-Demand Technology will automatically reactivate it. TuneUp Utilities 2011 automatically identifies programs that can be disabled safely and those that can’t. Not only that, it also displays the impact that each of these programs is having on system start, operation and shutdown. Additionally, you can also view ratings from other users of TuneUp 2011. This ratings system is a new feature of TuneUp Utilities 2011 and is present throughout the application. 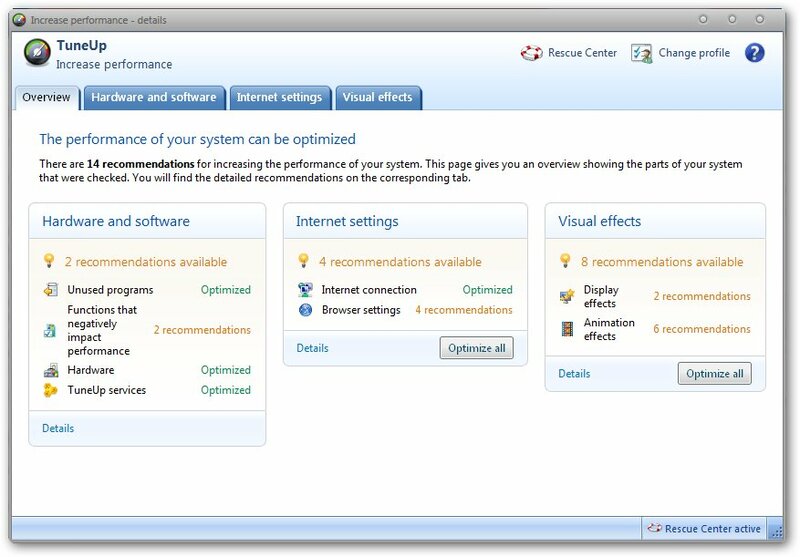 Improved Turbo Mode: TuneUp 2010 introduced a Turbo mode, which basically extracted every ounce of performance from your system by disabling aero and a gazillion of other non-essential services, and putting your system in the performance mode power plan. This is quite similar to what Game Booster does. However, I have found that TuneUp always manages to deliver a more marked improvement than the aforementioned freeware. The already impressive, Turbo Mode has been improved further in 2011. TuneUp isn’t revealing what has changed behind the scenes, but there are a few improvements on the frontend too. There are a lot more options to configure, and now you can even put your system permanently in Turbo mode. When it comes to improvements, that’s about it for TuneUp Utilities 2011. The list is actually quite short, when you compare it with the previous editions. I guess, TuneUp Utilities is already quite mature and there aren’t loads of new features that can be added. It already features a memory optimiser, registry cleaner, registry defragmenter, disk cleaner, disk defragmenter, disk space explorer, system tweaker, secure file shredder, deleted file recoverer (undelete), process explorer and more. 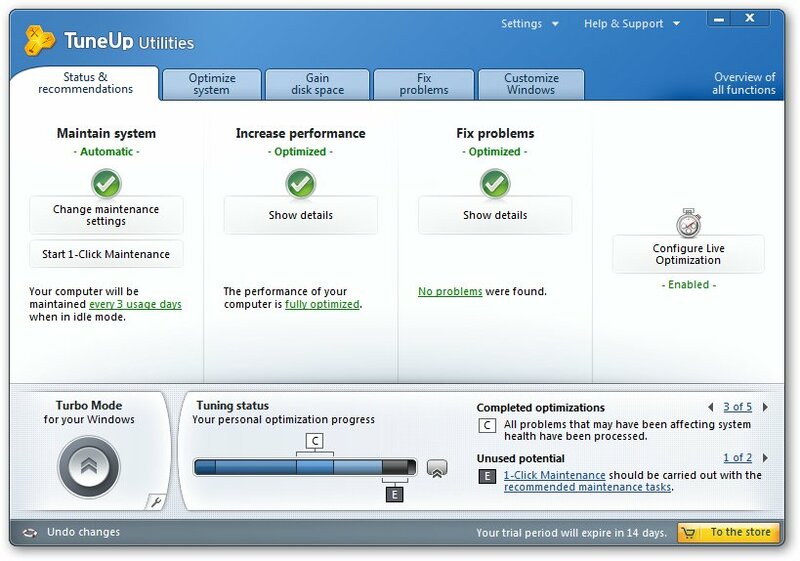 Earlier this week, PC Mag reviewed TuneUp Utilities 2011, and they noticed significant improvements in both system performance and startup after using TuneUp Utilities. Hopefully, the PC Mark Geekbench test will convince the sceptics that not all system suites are junk. However, to my surprise, Iolo’s System Mechanic 10 snagged the Editor’s choice award by the virtue of better performance and a more liberal license. Typically, one aspect of TuneUp Utilities that has always been unsatisfactory is the Drive Defragmenter. I suspect that this might be the case here too. The inadequacy of TuneUp’s defragmentation software is even more apparent to me as I use Raxco’s Perfect Disk, which is the best tool in its class. If you haven’t used TuneUp Utilities before or have a really old version, I would whole heartedly recommend TuneUp Utilities 2011 to you. However, if you have already paid for TuneUp Utilities 2010, it might not make sense to upgrade to the latest edition. Program Deactivator is an interesting feature, but that alone cannot justify shelling out 30 bucks. TuneUp Software has graciously agreed to sponsor 2 licenses. Here’s how you can win a TuneUp Utilities 2011 serial key worth $49.95. Blog about this contest, and leave the URL in the comment section to win 3 bonus entries (optional). The contest is open to everyone and will close on November 10, 2010 at 12:00 Noon IST. * In case of dispute my decision shall be final and binding. The contest is over, and the winners have been announced. great article about a great product . Tune up tuilities is one of the best system optimization programs I used the 2010 edition and it was great and now this new 2011 really looks better and I hope I could win ! Plz send me product key of TuneUp Utility 2011 if you have. Good Post…tuneup is a great system utility product….thanks for this giveaway contest….I have Re-tweeted your tweet https://twitter.com/rohitbatra14 and also Subscribed the mailing list….. Thanks for this Giveaway . Please count me in . 1. This is my comment . 2. Retwetted and my tweet : http://twitter.com/#!/MurphyReality/status/29209052650 . 3. I have subscribed to pallab.net and activate it. 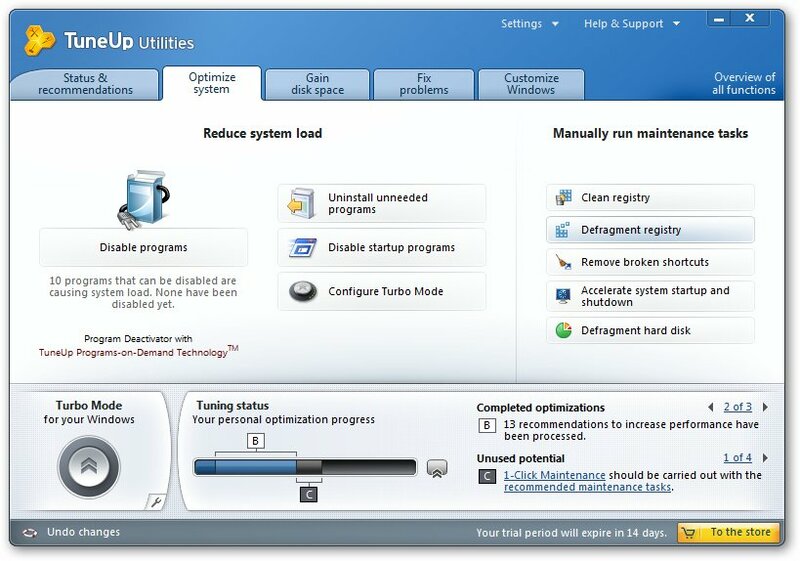 TuneUp Utilities has been proven optimized, repair and clean your PC with a click of a button. I notice a improvement in using TuneUp since version 2004. Now with its Program Deactivator, TuneUp Utilites become a superb software. Please include me in this awsome giveaway as I am a big fan of TuneUp Utilities. I’m currently running tune-up utilities 2009 on my PC and I must say it really helps me out when I have performance issues also its incredibly ingenious 1-click maintenance helps me keep my PC running smoothly on a regular basis! I wan to win this lisence to upgrade my current version. My retweet http://twitter.com/Najts/status/29215961435 im Subscribe to newsletter. Nice giveaway!. I have subscribed and retweeted: https://twitter.com/#!/emsocosme . Count me in =). Great product! Tune-Up Utilities is one of the best all-around utility products that I’ve come across. 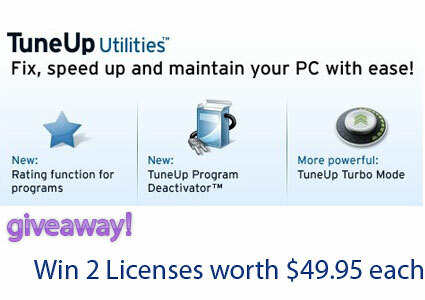 I’m currently running 2009; would love to win a license for Tune-Up Utilities 2011! Thank you for the opportunity! i have used the 2009 & 2010 TRIAL VERSIONS WORKS GREAT WOULD LOVE TO WIN A FREE license for the 2011 version first time on this site love tech sites!! view them every day here,s hoping i win this giveaway rodney thank you!! Tuneup utilities is one of the best utilities out there. I’ve always loved it. Have been using it since 2007. I especially love the drive defrag and one-click maintenance features, very helpful. I want it I took 2009 nine off that I still had a good serial # for and installed Iobit System Care Pro that I won somewhere. Not crazy about it though. Oh, man, I need this! I keep putting programs on my computer then not using them, and I know it is causing me trouble! And if this gets rid of some of the HP garbage that was loaded on my computer at birth, I need it even more! Ive got the 2010 version but im hoping to win the 2011 to give to my sister. If there is anyone who needs this software its her!! She has my old computer and I think this program would help her with some of the problems she has had..Hope I can win it for her. From what Ive read this is a great software so ill give it a shot and hope I win as I cant afford to buy it for now or the foreseable future…Got to save the money for other things…Darn it! Ohh, how I would like to win a license for this one! It’s a great utility! Tuneup Utilities is top class system optimization suite. The 2011 version is much better with program deactivator to shut down unnecessary applications. Its interface is also eye candy and easier to use. One click optimization is great! I have also subscribed to your newsletter. Include me in this giveaway. Thanks. TuneUp Utility always be the top 3 Utility softwares & hopefully this time can win the latest version to try. I have subscribed email newsletter. Thanks for nice Giveaway ,I think TuneupUtilities is best of great system utility product, please count me in. Tuneup utilities is the best utility software i have ever used.Its one click maintenance feature is awesome.Now it has new feature called program de activator which is simply the best feature for those who have a lot of software load on their computers like me.I really really want this product activation key. thanking you for the giving away. I am using old 2009 version which i get free from a promo. many new things added to version 2011, which will help in keeping my PC in good condition. Please count me in. I also have email subscription. So i do comment, subscribe and retweet. Please count me in. I’m using version 2010 and it is sensational. Highly recommend. I want to check whether the version of 2011 is really better than 2010. Thanks for the TuneUp 2011 giveways. TuneUp Utility always be the No.1 utility & is so reliable to optimize the windows system in all extends. I have already subscribed to your newsletter too. Wow! Great giveaway! I’m using TuneUp 2010, and I’d like to see what TuneUp 2011 has to offer. Note: I’m sorry. I do not have an account on “Twitter”. TuneUp Utilities 2011 looks great! It should be able to help me clean up my system… it’s getting slower and slower everyday! Here is my post on my blog. Its an adult blog only 18 aloud. Note: Sorry, I can’t allow adult blogs. I also have email subscription! Ages thanks to the Admin! Thank so much for Great offer . i already subscribed your e-letter . i would like to enter your giveaway. i really appreciate if i win one license. I am already subscribed to the mailing list of Pallab dot Net. I’m not a tech savy person. quite simple and use my lappy for normal use. This would slow down my lappy to the extent that I have to take it to the computer shop for repair. I tried for free the Tune Up 2009 version from a german promotion and was quite immpressed. I was wondering if the computer shop person uses the same things and makes huge bucks..you know what. It is going to be very helpful if I could win the 2011 version. As I read your post above, I am very amazed and excited. Also I rated it as 5star!! I really Love this software because from the time it was appeared, it was awesowe..
Hope I can win This Great Software!!! Pallab wish you a Happy Diwali. Thanks for this giveaway opportunity. I have used 2009 and using 2010 version. I loved using Turbo Mode in TuneUp 2010, and am please to see improvements for the same in 2011 version. The new feature of Program Deactivator is going to be a killer addition to TuneUp pack. This is something for which I had to install additional software apart from TuneUp. With the addition of Program Deactivator, it is going to be ONLY TuneUp for me.. It would be great if I could win a license for this MUST tool. Also I’m a subscriber using the same email as in my comment here. Thanks Grr. Have a great Diwali. saya mau tanya,up date tuneup untilities 2011. kok saya gak dpt enter product key nya? nice to know that new version of tune up utilities is now available. thank you pallab for the information. Tuneup Utilities is great for keeping my computer running smoothly. Love the one-touch feature. I’m using 2009, but would love to win the latest version. I did “tweet” this but can’t figure out how to link it to this post. (probably why I don’t use Twitter very much). Also signed up for your newsletter. A multipurpose tool reveal all the needed function for an expert and other computer users. Thanks for a nice, popular and powerful utility(TuneUp)..giveaway..
PS:- 2. Subscribed to Pallab.net Newsletter..
Great review, this program looks fantastic. I absolutely hate having to reinstall windows to get it running at peak performance again so this looks like what I need. Yes, reinstalling windows is very bad. Excellent Review. I love this Program. Thanks for Adding TuneUp Utilities As Well. It will get rid of any junk files in your registry that you may have left over on your coptumer. Whenever you uninstall a program it may leave some junk files on your coptumer that are useless except you have the full program on your coptumer. So these files are left in limbo by themselves just taking up space. One of the facial appearance on this program is that it will help clean up and get rid of those type of files. This would be awesome to win. Good luck to all the contestants. I agree, this review made me what to check it out. Thank you. Windows is a closed source system. Developers of tuneup utilities and registry cleaners do not have the core code of Win 7 and are not working on definitive information, but rather they are going on past knowledge and experience, most of which is not applicable to Win 7. Automatic cleaners will usually have to do some guesswork. Registry cleaners are pure snake oil. At best they do nothing except use resources. At worst, they can mess your system up, slowing it down, and even crash it. There is no utility out there anywhere that can speed Win 7 up and improve its performance, at least not at this time. I hope you do another contest like this. What a great piece of software. Tune up utilities will make easy the maintenance of the system that will help to enhance the speed of the system. It is one of the best maintenance program/software for the PC.